How to Call Bahrain from the U.S.
Fret no more if you’re wondering about how to call Bahrain. It can seem like an insurmountable series of digits and international code combinations, but we have the solution for you, a simple and easy-to-follow "How to Call Barhain" guide, found below. Say goodbye to calling confusion. Next dial 973, the Bahrain country code. Luego, marca el número de teléfono de 8 dígitos. Need more help with how to call Bahrain? Since Bahrain does not use specific city calling codes, here is a link to Bahrain’s telecom directory for residences, businesses and mobiles. Besides the complicated calling codes, you might find yourself unable to make your call because of numerous other restrictions built into phone hardware or possibly because of some other rare international rules. So check out these helpful tips when calling Bahrain. Some cell phones are preset to keep new users from making international calls without changing the settings or having the provider allow them to go through. So if your call to Bahrain won't go through, check to see that this setting is turned off. There are times when you're not supposed to use the area code when making an international call. This is because many countries have an assigned first digit they use instead of an area code. Be sure the country you're calling isn't one of these. When a number begins with a 0 or "trunk code" - a rare thing, by the way - it's only meant to be used when calling within a few certain countries. If you're not in one of these countries, though, just leave off the zero. A "VoIP" or Internet phone will often not require you to dial 011, the exit code for international calls. Again, check to see if your phone is one of these and dial accordingly. So we've got how to call Bahrain down to a science now, but you're still not sure what the most affordable way to do so is. Conveniently, we may have a solution to that problem too. Ambos Vonage World® y Vonage World Plus 1000® will give you the power to rip up your calling cards to Bahrain, but you’ll need to decide which is best for you. Does you mama in Manama want to call you from Bahrain for a change? If your closest want to be closer to you even though they’re far away, then please take a peak at what we have in store for you with our Vonage World y Vonage World Plus 1000 plans. With both plans you'll be sent a Vonage Box™ for free (including activation), and you'll get unlimited¹ calls to landlines in Bahrain. 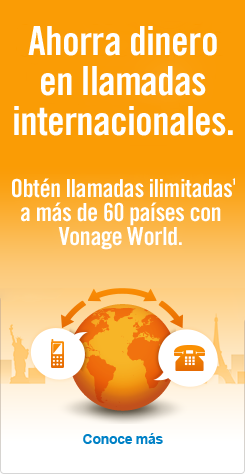 With Vonage World Plus 1000, though, you get unlimited¹ cell calls too, up to 1000 minutes a month. And after that it's just $0.06 per minute! That's just if you want to call Bahrain. If your parents would like to be the ones calling you, then all you need to do is sign them up for a Vonage account too. We'll send you a Vonage Box², which you'll then ship off to them, and from there on in, they will have the same U.S. area code as you. They can make unlimited cell and landline calls to the U.S. because they'll also have a U.S. number even if they still live in Bahrain. Free calls to Bahrain? With Vonage, the answer is yes. International calling apps are the bees’ knees, but where can you find the best one? Right here. Vonage Mobile® is our latest and greatest creation, a new international calling app for Android™ and iPhone® devices that's not only free to download but free to use. Call anywhere in the world on 3G, 4G and Wi-Fi. Have fun. It's on us! ²Debes inscribirte en una cuenta adicional y seguir siendo responsable por todos los cargos y las actividades de cada cuenta, así como también del envío del adaptador y el cumplimiento de las leyes del país fuera de los EE. UU. donde el adaptador de Vonage puede ser usado. El soporte al cliente de Vonage sólo se ofrece en inglés y español. El servicio 911 de Vonage no funciona fuera de los EE. UU.